A clever gadget is helping Bury Council win the war on potholes. The highways department spent £100,000 on the specialist Jetpatcher™ machines so engineers can fill potholes quickly and easily as they no longer have to tear up a large section of road. New figures suggest the Jetpatcher™ machines are helping town-hall bosses to fill in more potholes and reduce the number of complaints. Cllr Alan Quinn, the council’s environment representative, said: “We are constantly striving to increase efficiency and, as a part of this process, we are trialling the use of a spray injection patching machine to improve how we repair potholes throughout the borough. In the 12 months up to the end of March 2015, the council received 2,198 reports of potholes, compared with 2,430 in the previous 12 months. Nuttall Lane in Ramsbottom was the most complained-about road in 2014/15, compared with Bury New Road in Prestwich and Whitefield in 2013/14. In 2014/15, 115 people made legal claims to the council for compensation after alleging their vehicles had been damaged by potholes. Seventy-six were successful and they received a total of £25,414. In 2013/14, 173 motorists made claims and 120 were successful and were awarded a total of £35,280. The figures were published by the Federation of Small Businesses (FSB) whose regional chairman for Greater Manchester, Simon Edmondson, said: “Our members rely heavily on the local road networks to do business. Poorly maintained roads impede that. “While this research shows councils are, on the whole, making some headway in maintaining our region’s road network to an acceptable standard, there’s still room for improvement. 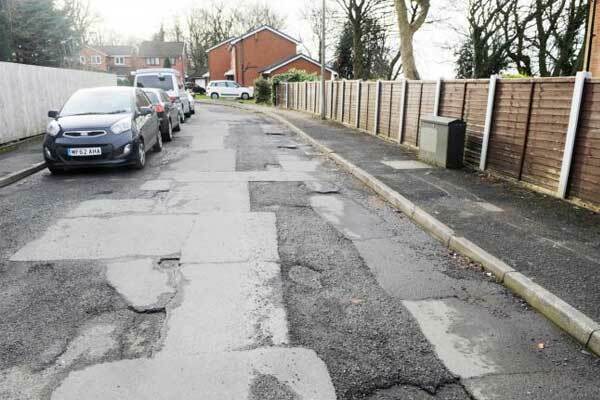 The figures show Bury Council spent £1.7 million on road repairs in 2014/15, compared with £2.6 million spent by Wigan Council. How does the Jetpacther™ work? Initially formed in New Zealand in 1985 and with ongoing development since then the company now has supplied more than 450 units worldwide and has Jetpatcher™ units in many areas including the United Kingdom, Mexico, USA, South Africa, Europe, Asia and Australia. We are an honest, reliable and well-reputed company that will work with you during the ordering process to ensure the correct machine type and specifications, will keep you informed during the construction and delivery process and are always available for after sales support and service if needed. Jetpatcher™ is the only machinery that utilizes a specialized distributor system which allowsJetpatcher™ to provide high production rates with little wear as there are no moving parts. This eliminates costly time and maintenance costs for the operators. Nu-phalt™ Thermal Repair and Jetpatcher™ Spray Injection are delighted to officially announce the launch of our newly designed websites! Our goals were to provide visitors with easier access to information, easier ways to collaborate and enable us to showcase our upcoming news and projects. Take a look around and let us know what you think by contacting us here. At Nu-phalt™, we think of ourselves as ‘the one stop solution for road repair” and work tirelessly to develop our systems to be innovative and efficient. Our gleaming new website will help tell showcase our services in an engaging way by guiding visitors through the different areas of our businesses. In addition, we want our new website to encourage local authorities, main contractors, heads of highways and other asset managers to look seriously at our solutions for road repair whether it be an urban or rural application. So why relaunch our website now? Following our redesign, we are able to engage with our ever-growing audience in new and better ways – including through greater social media integration and mobile compatibility. This will create a higher quality user experience, regardless of what device you are using to access the website. Another significant boost for us is that our new upgrades have provided a consistent layout, structure and navigation flow. All this is ultimately part of the Nu-phalt™ vision ‘to be the leaders in Road Repair and Civil engineering and this is now reflected by our new website. We hope you enjoy the new website and all the exciting new features it offers. Innovative Spray Injection Patching company Jetpatcher™ are yet again building bespoke systems for their clients. Midlothian Council has requested their second Jetpatcher™ to replace the existing Jetpatcher™ that they have. The previous Jetpatcher™ had been in service with Midlothian Council for 12 years before ordering the new system. Jetpatcher™ have converted an Econ Chassis to enable the Council to have a multipurpose machine. This flexible option allows for them to either use the Spray Injection System or a Gritting system simply by transferring whichever one they want to onto the Econ Chassis. It’s a very innovative piece of engineering which allows for Midlothian Council to get regular use of the vehicle Chassis in order to maximise the use of the fleet. Jetpatcher™ is the only machinery that utilizes a specialized distributor system which allows Jetpatcher™ to provide high production rates with little wear as there are no moving parts. This eliminates costly time and maintenance costs for the operators. More than 500 machines already in service around the world. The machine is highly productive with minimal waste material. With a driver and operator one Jetpatcher™ machine can replace a complete road repair gang. Jetpatcher™ have been able to restore and refurbish their clients machines for over 10 years, and are constantly working in partnership with these clients creating solutions to ensure a strong Asset Management Programme. The introduction of Jetpatcher™ at the end of 2011 has been a welcome addition to the Nu-phalt™ surface dressing portfolio. The facility has gained significant interest from the highways industry resulting in 8 new Jetpatcher™ systems being delivered to clients in our very first year of operation. Our in-house contracting facility has also seen considerable demand from customers looking to hire in Jetpatcher™ services. To meet growing customer requirements for surface dressing in 2013 we have made significant investment in new systems taking our current hire fleet to 7 Jetpatcher™ units with a further 4 units on order for Qtr 2 delivery. This investment will allow Jetpatcher™ to support a wider customer audience and through the most competitive rates deliver best value from demanding maintenance budgets. The customers below have experienced our service levels and taken advantage of our competitive proposition. Jetpatcher™ were approached to mobilise a system to carry out spray injection patching for Essex highways in 2012.Within three weeks of the operation an additional system was requested which was mobilised and fully operational within two weeks of the request. A third Jetpatcher™ system was drafted in shortly afterwards to support their maintenance program. To address as many areas as possible for as long as possible Essex CC had a Jetpatcher™ system in operation through to the middle of December. Over the course of an 18 week programme all three Jetpatcher™ systems had completed a combined total of 821 m3 / 32840 m2 of patching throughout the Essex highways network. Each Jetpatcher™ system comprised of a 3-man team a driver a skilled operative with a third supporting operative. The third mans primary duty was to ensure a clean safe and tidy site with compaction of each repair to reduce loose stone chippings. We successfully secured a tender for Northumberland CC last year. Being a vast rural area the Jetpatcher™ system was very influential in the total number of repairs completed over a 10 week schedule. The system was also used to support Northumberlands presurface dressing operation. As a result of the excellent service levels experienced by Northumberland highways we have successfully secured an additional programme of works planned to start in February through to April 2013. Jetpatcher prides itself by offering our clients the most competitive hire rates in the industry through quotations or tender arrangements. The high service levels delivered to Buckinghamshire during the Jetpatcher™ trial lead them to consider the Nu-phalt™ system to support their urban reinstatement requirements. This resulted in a 6 week trial with Nu-phalts single vehicle solution to hot patch repairs becoming a resounding success with the award of a 6 month hire scheduled for April 2013. The combined portfolio of Nu-Phalt™ and Jetpatcher™ give local authorities the ability to select the right application for the right defect thereby managing limited resources more effectively. We welcome the opportunity to sit down with you to discuss your future network requirements and the prospect of supporting your 2013 requirements through our highly competitive rates. Read ‘Nu-Phalt Case Study Brighton & Hove City Council’ here.